The present Defence Establishment Orchard Hills occupies a site first used for military purposes by the US Army, who constructed a chemical weapons depot there during World War 2. According to documents now in the National Archives of Australia (parent files are listed at the bottom of this page) the depot was known as the "U.S.A.S.O.S Ordnance Depot"; the acronym standing for "US Army Services of Supply". A report of a NSW Supreme Court case published in the Sydney Morning Herald of 30 April 1946 states that an area of 1100 acres was requisitioned by the Minister for the Army under National Security Regulations in October 1942. The same report refers to a US Army presence there not later than the following month. The property is described as Claremont Park, Bringelly Road (now The Northern Road) Kingswood and the owner as Mr R. T. Hook. From the article it can be inferred that this was not the only property resumed for the Kingswood Storage Depot, as the site is called in the report. 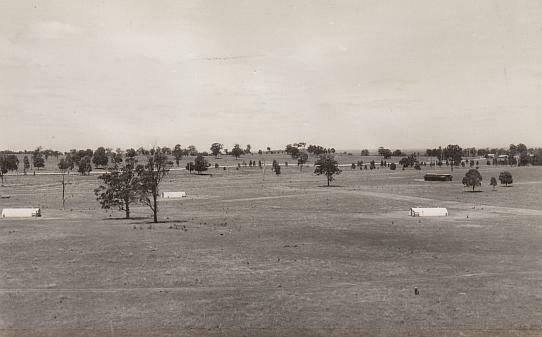 These additional parcels of land comprised some adjoining the main storage area on the eastern side of Bringelly Road, Castle Road, which bounded the storage area on its northern side, and a number of parcels on the western side of Bringelly Road and north of Kings Hill Road that were acquired for camp facilities. 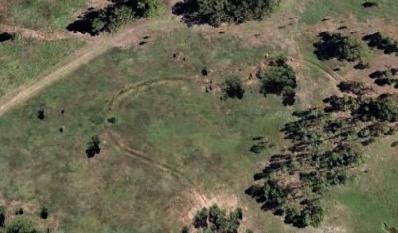 The camp area is shown in the survey below. On 30 October 1946 the Sydney Morning Herald contained an auction advertisement relating to disposal of buildings at the Kingswood Naval Camp - this most likely refers to the US Army camp. There is no evidence in this list of any substantial ammunition workshop facilities. Other possibilities are the 55th and 59th Ordnance Ammunition Companies, although they seem to have moved rapidly northwards in support of operations in New Guinea. However it is known that there were many improvised management arrangements at this time, and there may have been different units at different times. Some background to the period is given in The Ordnance Department: On Beachhead and Battlefront by Lida Mayo, (United States Army in World War 2) 1968 pages 49-57. "The Ordnance companies that arrived with the main body of the 41st Division at Melbourne the second week in April (1942 - ed.) were the 37th Ordnance Medium Maintenance Company, the 84th Ordnance Depot Company, and the 55th and 59th Ordnance Ammunition Companies. The 84th Depot Company established at Seymour (north of Melbourne) the first Ordnance general supply depot in Australia. Soon the new arrivals were scattered all over Australia. The 37th Ordnance Medium Maintenance and the 55th Ordnance Ammunition Companies were sent to Brisbane to provide service to air and antiaircraft units there and at Base Section 2 at Townsville. The 84th, for many months the only depot company in Australia, furnished an officer and five enlisted men to form the Ordnance Section of Base Section 7 at Sydney, where distress cargoes, chiefly Dutch, were piling up. 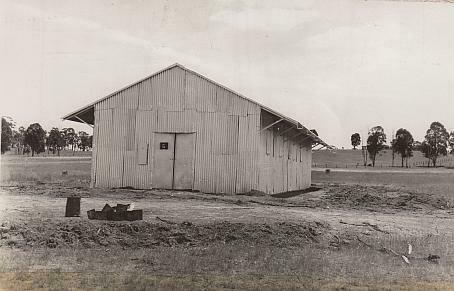 The 84th also supplied a detachment to operate a general supply depot at Adelaide on the south coast, the headquarters of the 32d Division. The 118th Ordnance Medium Maintenance Company, commanded by 1st Lt. Frederick G. Waite, arrived with the 32d Division. The company landed without its tools, equipment, repair trucks, or parts, but the young commander managed to acquire some distress cargo tools at the Adelaide port. In the circumstances, Waite remembered later, the job of supporting the division "was not done as well and as thoroughly as we desired, or as the combat troops had a right to expect" but "did get done after a fashion." In addition, he had to send detachments to aid port operations at Sydney, an antiaircraft regiment at Perth, and the task force at Darwin. It took the most careful planning by Colonel Holman's office to make the best use of the very scarce Ordnance troops. 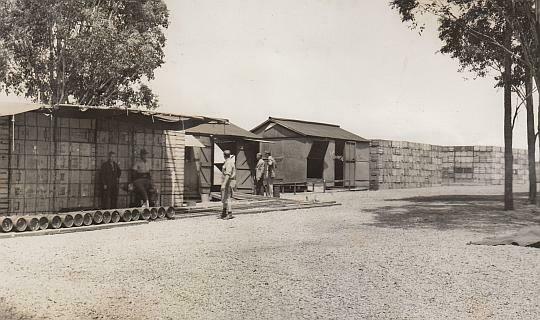 The depot and ammunition sections that had arrived in March were organized into the 360th Ordnance Composite Company, activated on 1 May, and sent about 100 miles north of Adelaide to operate at one of the transshipment points on the overland route to Darwin. Between Darwin and the cities of the eastern and southern coasts there was a gap in the railroad line of as much as 600 miles. This had to be bridged by truck or air transport. The 25th Ordnance Medium Maintenance (AA) Company was given the job of supporting the 41st Infantry Division, but be cause this company was especially experienced in antiaircraft artillery, it had small detachments at Brisbane, Townsville, and Perth working on fire control instruments and instructing other Ordnance companies in that kind of maintenance. Out of the effort at Townsville grew the very important Townsville Antiaircraft Ordnance Training Center directed by the commander of the 25th, Capt. William A. McCree. The necessity of splitting Ordnance companies into detachments placed a severe drain on organic unit equipment. A single machine shop truck might be adequate for the work of a medium maintenance company, but when the company was split into detachments operating in four separate areas the men would need four trucks instead of one; an aviation bombardment company would need additional truck cranes; an ammunition company, a larger supply of tarpaulins. All required more messing equipment, and also water trailers for operations in a country where water was scarce. Mobile equipment operating over poor roads, or none at all, required an ample supply of spare parts. Six months after the Pensacola convoy landed (in late November 1941 - ed.) with one Ordnance company, Ordnance strength in Australia stood at 145 officers and 3,500 enlisted men. There were four ammunition companies (out of twelve requested) ; three medium maintenance (out of five requested); one depot (out of five requested) ; one composite; and fifteen aviation companies — six air base, six bombardment, and three pursuit. With these men, most of whom had been in Australia less than three months, Colonel Holman had staffed five ammunition depots and five maintenance and supply depots, was providing Ordnance service to two divisions and fifteen air groups, and was handling incoming supplies and transshipments at seven ports." Anecdotal evidence says that the US Army Depot was worked principally by African-American soldiers. This would have been consistent with the experience in Queensland. 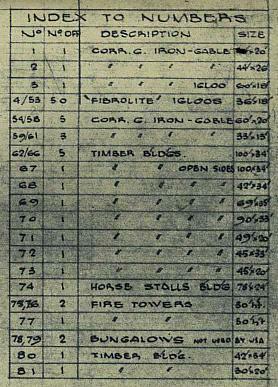 The list of camp buildings above shows duplicated kitchen and latrine facilities suggestive of segregated facilities, although other interpretations are possible. Some Australian civilian labourers were also engaged; some of these were later employed by the RAN and were still working there into the 1980s. 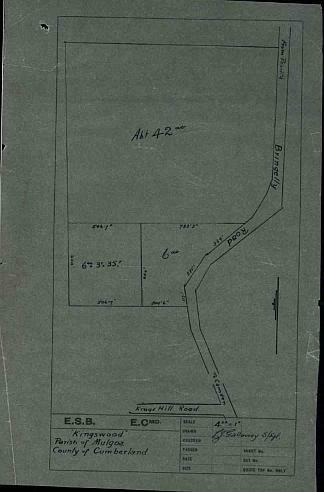 "Kingswood - F. G. MacLaughlin's property, balance of R.T. Hook's property and council road. Kingswood - E.W. Fowler's property. area 6 acs. Kingswood - E.W. 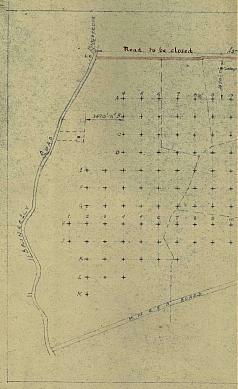 Fowler's property, 42 acs. & easement. Kingswood - E.W. Fowler's property, area 6 acs. 3 rds. 35 pchs. Kingswood - Castle Road. 21 acs. 1 rd." It therefore seems likely that the US Army had vacated all its holdings at Kingswood by this date, with 28 May 1945 being the likely handover date for all. The source of these stockholding figures is National Archives of Australia item "Chemical warfare plan - South West Pacific Area - policy" (NAA A705,15/31/3). This item contains an earlier report, dated 1 March 1943, that records the stockholding as 45,335 and 8,352 rounds of 105mm and 155 mm respectively. Kingswood, Sydney - 53,000 mustard gas and phosgene artillery shells"
In late 1945 sea dumpings also occurred off Cape Moreton near Brisbane. Records state a total of 8,000 tons of CW munitions, believed to represent all the stocks of CWA stored in Australia under US control were disposed of here. This figure probably includes the weight of the containers which housed the agent (be it an artillery shell, storage container or bomb) and hence the amount of actual chemical agent could be less than 8,000 tons. What was dumped is unknown, however an inventory from 1943 is available which shows the US CWA reserves included bulk mustard, tear gas (CNS), lewisite and solid adamsite candles (see Appendix A). As shown in Appendix A, the US controlled stocks of CWA at sites far removed from Brisbane including Geelong in Victoria, Kingswood in New South Wales, Charters Towers and Kangaroo in northern Queensland. It is very unlikely the stocks at these sites were transported to Brisbane to be dumped off Cape Moreton. Only the US stores of CWA in South East Queensland are likely to have been dumped off Cape Moreton. It is known that a large quantity of CW from the US depot at Darra (Brisbane) was sea dumped off Cape Moreton as shown in this extract from a newspaper article; "although the disposal had been going on for months, there was still 2,400 tons of gas to be dumped. (pages 10-11)"
There is some evidence to support the hypothesis that the Kingswood stocks were returned to the Darra Ordnance Depot for disposal about March 1945. The Monthly Historical Summary for the US Army's 105th Chemical Processing Company for March 1945 reported that "Eight men traveled to Sydney, NSW, for the purpose of acting as train guards for returning shipments of H munitions to Darra Ordnance Depot. This Sydney assignment proved quite popular with the men involved." 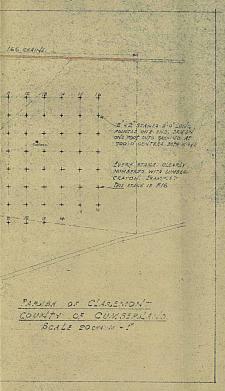 This date fits well with information that the Kingswood depot was vacated in May 1945. 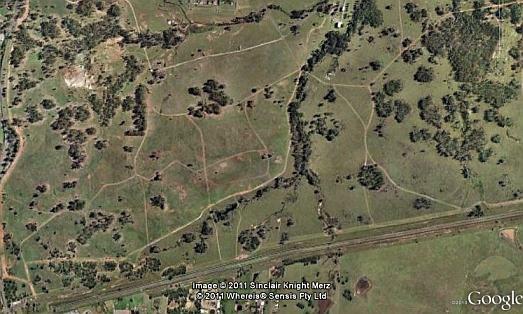 The depot was located on an area of land that now comprises the south-western quadrant of the Defence Establishment Orchard Hills (bounded by Bringelly (later the Northern) Road to the west and the Sydney Water pipeline to the south. In later times this was referred to as the "Old Area" or "ANZAC area" of RANAD Kingswood. The origin of the ANZAC reference isn't clear, although it does appear on at least one survey of the area. The recent photo below shows most of the US Army depot site; the original road layout is still evident due to continued use for security patrolling. A few buildings remain, and the sites of others can be deduced from the ground disturbance. About 1970, earth for traverse construction was being excavated from a borrow pit (disturbed area at top left of photo above) in the Old Area when a buried projectile, probably a relic of the US Army occupancy, was uncovered. This was destroyed by counter-mining, the RANAD's Foreman of Laboratories, Harry Creighton, undertaking the demolition after the attendance of police to halt traffic on Bringelly Road. During the same era, a long cutting was constructed in the Guided Missile Unit to construct a cleanway servicing the Tartar missile workshops. After heavy rain, what appeared to be some type of pyrotechnic device washed out of the sides of the cutting. It's possible that these were Adamsite candles. Adamsite was a highly toxic predecessor of tear gas. The author of this page first visited the site in 1967. At that time, all available buildings were full, and obsolete UK-origin aircraft ammunition was being field-stored there whilst awaiting disposal by sea dumping. 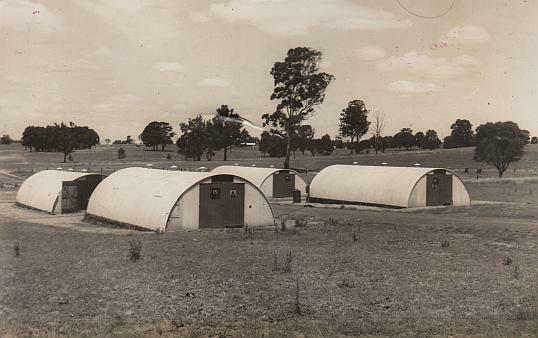 The buildings were Sidney Williams huts (prefabricated steel and corrugated iron structures), with degraded earth traverses (functioning mainly as "bunny apartments"). The remains of a temporary laboratory were evident, with traversing provided by earth-filled ammunition boxes. The theft of copper linings from these boxes, and of copper earthing tapes from huts, was a constant problem. There was no reticulated water supply, and fire fighting equipment was limited to beaters made from old fire hose. Old cartridge cases served as fire warning bells, and the area was being grazed by cattle under lease. 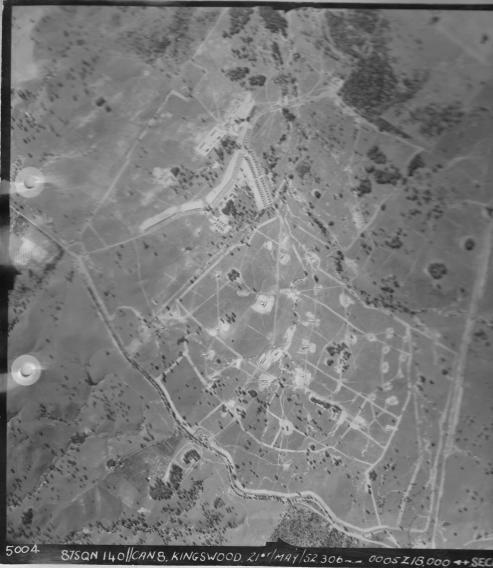 Also evident, as it still is today (see aerial photo below), was a canal which formed part of George Chaffey's ill-fated Mulgoa Irrigation Scheme which foundered in the depression of the 1890s. It appears that the file dealing with the acquisition of the storage area (Mr Hook's property) has not survived. If you can contribute information, photographs or memories, please contact the author at the email address given at the foot of the page.